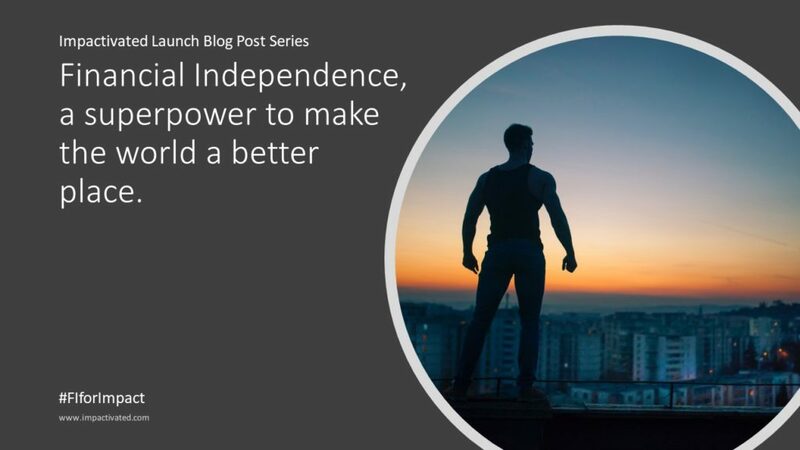 In the previous posts of this series, we’ve dreamed about how much good the FI community could do, we’ve described the 4 elements of the FI superpower and we’ve explored how we can do good using the FI mindset. In this post we’re looking at how much good we’ve already achieved, both in the area of financial education and beyond! While the concepts of financial independence early retirement have existed for a while, they were described and firmly established by Vicki Robin and Joe Dominguez in their 1992 best-selling book Your Money or Your Life. The concept was later developed further by Jacob Lund Fisker on his blog and his 2010 book Early Retirement Extreme. The concept of financial independence has later been popularized by bloggers such as Mr. Money Mustache and the MAD Fientist. Since then, many new blogs, podcasts, forums, groups, and video channels have appeared, and the movement has been growing at an incredible pace in the last few years. Several community members have also written books, in which they share their experience and help others better manage their finances. By broadcasting its message, the FI community is helping millions of people to better take control of their finance, which in turn, gives them tools to live better lives. This financial awareness and education is having a great positive impact. In addition to educating about financial independence, a lot of the more mature bloggers and podcasters are also sharing knowledge and experience about their life philosophy, touching many important aspects of life. And beyond philosophy, some also show the example by taking action. Pete Adeney (aka Mr. Money Mustache) donated USD 100,000 to charity in 2016 and then USD 105,000 in 2017. Of his 205,000 USD donation, USD 125,000 went to effective charities, mainly via GiveWell.org. This is important, because selecting the right charities can make a very big difference in impact and selecting the wrong one can lead to negative impacts.As explained in. In his blog posts, Pete writes beautifully about his decision process and the psychology of giving. His donations have helped save many lives and helped make the world a better place. It’s a beautiful example of how one can use the power of Money Freedom to do a lot of good. And his writing have inspired many people to be more altruistic and generous. High highly recommend reading his posts on this! In 2018, Paula Pant and the Afford Anything community raised more than USD 20,000 for charity:water. This is a beautiful example of the power of our community. In addition to raising money from listeners who got value from Paula Pant’s work, some community members were able to make large donations thanks to being in a financially safe position. One listener in particular, Richard J Potter, made a big difference: he decided to encourage additional donations by matching them up to USD 4,000. In total, he donated USD 8,000 to the cause and he explained that he was FI and hence he was in a position to give back to worthy causes. In this example, Paula understood the power of our community and Richard clearly demonstrated how we are in a unique position to have a positive impact using Money Freedom. Mr. W from What Life Could Be is reducing local pollution in his town by influencing the authorities and raising awareness about garbage and the environment. In his blog post, Mr. W describes how he noticed an obvious environmental issue (illegal dumps around his town) and its causes (lack of awareness, lack of enforcement) and how he took action to fixing them. In just a few months, he managed to influence his town council to take action, organized awareness campaigns and saw the recyclable rubbish collection rate almost double compared to the previous year. With this action, Mr W demonstrates how we can use the Time Freedom and Thinking Freedom elements of the FI superpower: we can support causes that are important and neglected. We can take action because it matters and not only because we’re getting paid for it. Alan Donegan and the PopUp Business School do social good by teaching people from underprivileged communities how to start their own business without loans, without them having to pay for the courses. Their innovative business model basically provides entrepreneurial training and coaching for the people who need it the most. And they do this by getting large organizations to pay for the trainings. This is a powerful example of someone from the FI community using social entrepreneurship to create a positive change, maximizing the use of Abilities Freedom on the way to FI. Mrs WoW from Waffles on Wednesday recently volunteered in a clinic in a remote village in Peru. In her blog post she describes her experience travelling to remote areas in South America and helping some of those who need it the most. She tells us how having a positive impact can be a truly life changing experience: the challenges she faced, the culture she discovered and all the new skills she picked up on the way! Mrs Wow gives us an incredible example of how we can do good with Time Freedom and Abilities Freedom, even while pursuing FI! These are just the examples I could find. I am sure there are a lot more and would love to hear about them. Please contact me or let me know in the comments if you know any other good example! In the next post, we will be diving into some of the ways we can have a real positive impact, effectively. Stay tuned! I would like to thank Brian Roberts for his feedback and suggestions for the post.